My legs hadn’t fully recovered from a bit-too-long training run a couple of weeks ago and I’d been looking to do a 4 to 5 hour trail run that didn’t involve a huge amount of elevation gain. In the areas of Southern California where I run, it’s tough to find a 20 mile trail run that isn’t hilly. 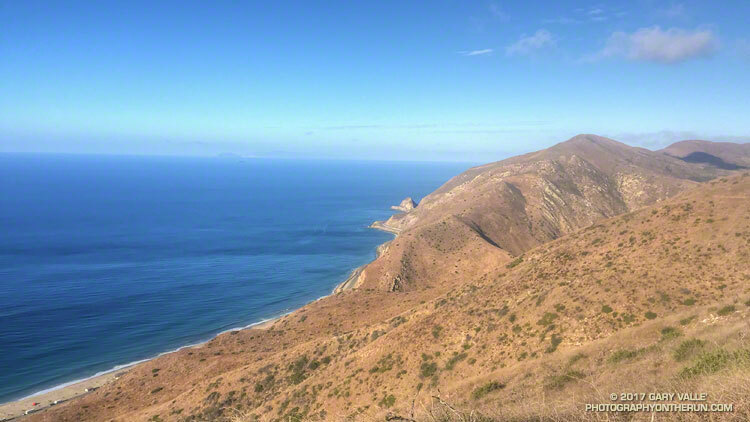 With “only” about 3000′ of gain, I’d opted to do an out and back to Mugu Peak from from the Wendy Drive trailhead in Newbury Park. 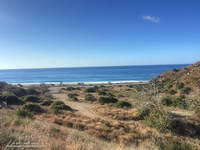 La Jolla Valley Loop Trail and La Jolla Canyon. Click for larger image. 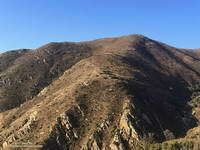 Mugu Peak is a very popular summit. With the La Jolla Canyon Trail still closed, most of the hikers doing the peak are now using the Chumash Trail as an alternate. 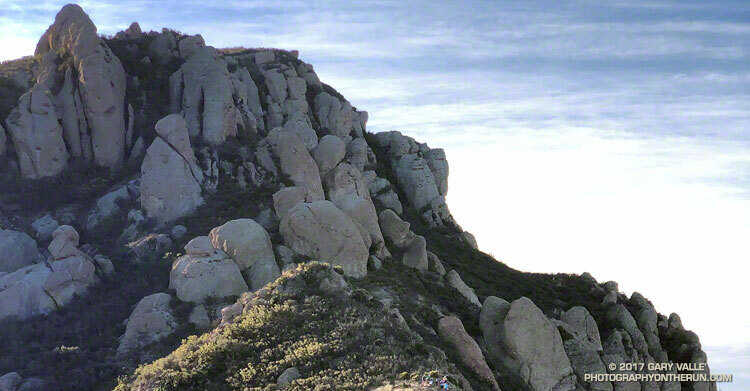 Runners have more options and can reach the peak from the Ray Miller, Sycamore Canyon, and Wendy Drive trailheads. At the moment I was about a mile north the Danielson Multi Use Area, running on a paved section of road in Big Sycamore Canyon. The Sin Nombre and Hidden Pond trails can be used to avoid this stretch of pavement, but at this point in a long run I usually just want to get to the Upper Sycamore Trail as quickly and easily as possible. Pt. Mugu from Mugu Peak. Anacapa and Santa Cruz Islands are in the distance. Click for larger image. Running a couple of miles on pavement isn’t necessarily a bad thing. 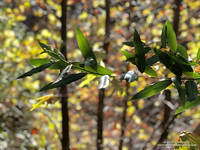 Especially in Sycamore Canyon. The road is lined with sycamores and oaks and there is plenty of shade. The uniformity of the road is both good and bad. It’s good because the running is more automatic and bad for the same reason. It can be tedious — especially on tired legs at the tail end of a long run. The traffic along the road is usually not an issue. Today, I had passed a couple of groups of hikers and been passed by a few mountain bikers. Most of the time the road was empty. California bay along the Upper Sycamore Trail. Click for larger image. I first heard the sound some distance behind me. Hissing isn’t quite the right word. It was a synchronized blend of aerodynamic, mechanical and road noises and it was getting closer. At first I thought it might be a ranger’s truck, but it didn’t sound like a vehicle. I glanced behind me to see a mass of approaching cyclists, and wondered how many bikes there would be. I heard a shout of “Right!” as the lead cyclist alerted the group, and in an instant the peloton began to sweep past. I felt a little like the breakaway racer that is inevitably consumed by the unrelenting pack. For a few moments I could feel the push of the peloton and then they were gone. The last day of 2017 had been a near perfect day for a trail run. 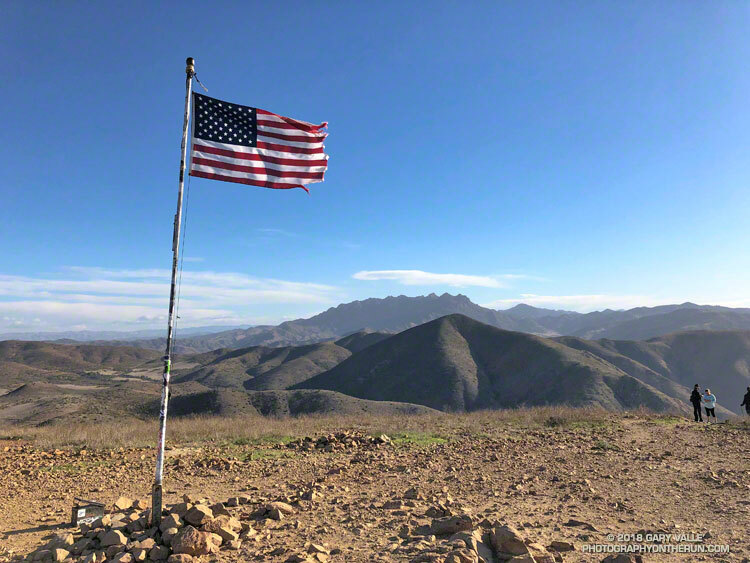 I’d started my adventure with an ascent of Boney Mountain’s western ridge — joining the Trail Runners Club on their annual scramble — and then continued to Tri Peaks and Sandstone Peak, the highest peak in the Santa Monica Mountains. A circuit of the Mishe Mokwa loop had added a few scenic miles and put me on the Chamberlain segment of the Backbone Trail, headed west. 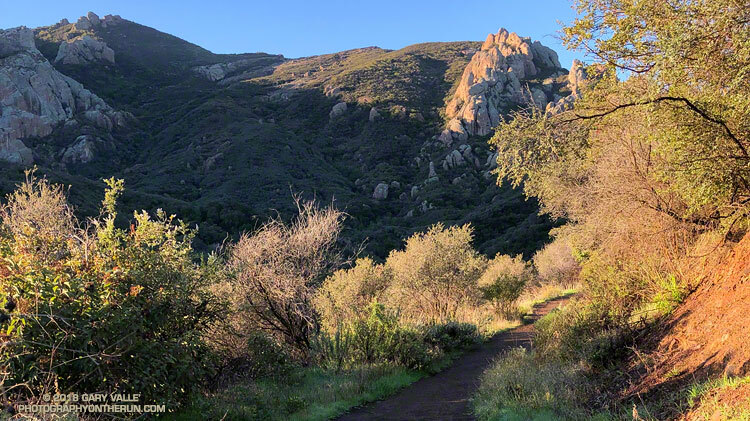 About a half-mile past the Backbone Trail’s western junction with the Tri Peaks Trail, the Backbone Trail begins a 4.7 mile, 2400′ descent to Sycamore Canyon. I had started this descent and was nearly down to Chamberlain Rock, when I heard voices on the trail ahead. They sounded like they were just around the next switchback. Slowing to a walk, I rounded the sharp corner. Three smiling hikers said hello, and I wished them a Happy New Year. What?? Surprised by the answer, I blurted out something like, “You’re kidding, right?” They were miles from where they thought they were and headed in the opposite direction they should be. Every step down the trail was taking them farther and farther away from their intended destination. They looked fit, experienced and well-prepared, but somewhere along the way, they had taken a very wrong turn. From what I could determine they had intended to do the Mishe Mokwa – Sandstone Peak loop counterclockwise or a variation that involved Tri Peaks. Apparently, at the top of the Mishe Mokwa Trail instead of continuing toward Sandstone Peak on the Backbone Trail, the hikers decided to take the Tri Peaks Trail. They followed the Tri Peaks Trail until it ended at the Chamberlain/Backbone Trail, about two miles west of Sandstone Peak. At this junction, to get back to Sandstone Peak (and their car), they needed to turn left (east). Instead, they turned right and headed down the Chamberlain Trail. The good news is they only had gone about a mile down Chamberlain from the Tri Peaks Trail junction. This put them about 2.5 miles from Sandstone Peak and about 4 miles from their car. It was around noon and the weather was good. If they had no route-finding issues on the way back they would probably still have time to do Sandstone Peak. They just would be doing more of an End of the Year adventure than they planned. There’s magic in the morning, when the owls hoot softly and there is a chill in the air. I’d started my run from the Wendy Dr. trailhead when there was just enough light to see the trail. The moon was poised low in the western sky, full and bright. As I passed the frame of the Chumash ‘Ap at the Satwiwa Native American Indian Culture Center I’d thought about the Chumash, and how well they must have known this land. It is one thing to visit a place, and quite another to live there. Moon setting over Rancho Sierra Vista/ Satwiwa. Today the plan had been to run to the Ray Miller Trailhead and do a little of the Ray Miller 50K course along the way. At the start of the run I hadn’t decided which route I was going to take to Ray Miller — Hell Hill or Fireline. I’d finally opted for Fireline, since that route would follow the last 5 miles of the 50M/50K course and is much more runnable. I hadn’t run Fireline since the 2013 Ray Miller 50K. With only 7 miles on my legs (instead of 26) it didn’t seem nearly as steep. Once at the top of Fireline, and after doing a bit more uphill on Overlook fire road, I eventually got to the best part of today’s run — the 2.5 miles of scenic downhill on the Backbone Trail to the Ray Miller trailhead on PCH. 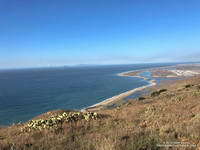 PCH at the Ray Miller Trailhead. The Pacific was painted in a palette of wide-gamut blues and although it was hazy offshore, there were excellent views along the coast. To the west Anacapa and Santa Cruz Islands could just be seen in the ocean haze and Mugu Peak loomed golden in the morning sun. The Ray Miller Trail is very popular and on the way down I passed several runners in the first miles of their morning run. At the Ray Miller parking lot my Garmin fenix read 12 miles. Just like climbing a mountain, getting to the turnaround point of a long self-supported run is only part of the adventure. I gulped down some water at the water fountain; checked how much water I had left in my pack; ate a Snickers left over from Halloween; and then started the 1000′ climb back up the Ray Miller Trail to the Overlook fire road. 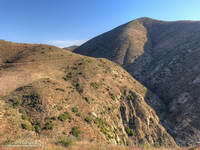 The Mugu Peak Trail starts in upper La Jolla Canyon and climbs up and around Mugu Peak. The run was going well and at the start of the climb I was thinking about following the 50M/50K course up and around Mugu Peak before starting the trek back to Wendy Drive. By the time I’d reached the top of Ray Miller and had climbed up to the high point of Overlook fire road my mileage appetite wasn’t so big. Following a short side trip into La Jolla Valley, I returned to the Overlook fire road, descended Hell Hill and Wood Canyon, and started working my way back up Sycamore Canyon on the Two Foxes Trail. At the Danielson Multi-use area there was a large group participating in a guided hike. A familiar runner with a distinctive hat was making his way around the group. It was photographer and ultrarunner Larry Gassan. Larry joined me for the remainder of the run and his stories made the run back up Sycamore Canyon and Upper Sycamore much more interesting. Mustard on the Old Boney Trail. I was covered with bright yellow mustard petals and soaked from head to toe. 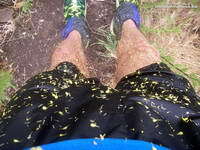 It had been raining, and I’d just wrestled my way through another tangle of 10 foot high mustard plants. 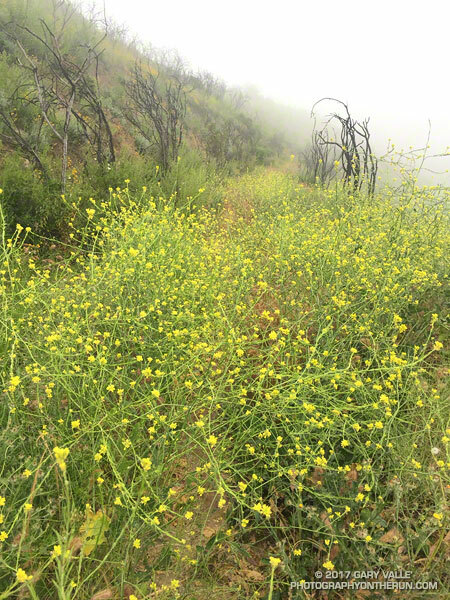 On some parts of the Old Boney Trail the mustard was so thick it was almost impenetrable. The pestilent species becomes especially prolific in wet years, growing rapidly and overwhelming native species and habitats. After turning onto the Serrano Valley Trail and climbing up to the overlook of Serrano Valley the trail wasn’t quite so overgrown — at least I could run. In the grasslands below the greens of the rainy season were gone, replaced with the straw-colored hues of dried grass gone to seed. Like mustard, foxtails are bad this year. In recent weeks I’ve picked a multitude of the barbed grass seeds from my socks and shoes. Today, I’d worn ankle gaiters hoping to ward off the expected seed-storm in Serrano Valley. The seed-storm turned out to be more of a seed-shower, but the gaiters did help. What?? Were there ogres down there? He’d obviously made it through the canyon OK. All limbs were intact and I didn’t see any cuts or bruises. I quickly ran through the possibilities and rejected most of them. One possibility that seemed plausible was that the trail had been washed out. One of the reasons I was doing this run was to see how Serrano Canyon had fared during the February 17 atmospheric river event. I’d seen the damage caused by high flows in Blue Canyon and Upper Sycamore Canyon. This was the first chance I’d had to investigate Serrano Canyon since the flooding, so the hiker’s warning had the opposite of its intended effect — it just made me more curious about what was going on in the canyon. All the way down the canyon I kept an eye out for X-Files monstrosities, but saw none. Serrano Canyon did not appear to have had as severe flooding as Blue Canyon and Upper Sycamore Canyon. Some sections of the trail were very overgrown and a short section of the trail was partially washed away, but with care and a bit of mustard-whacking the trail was passable. 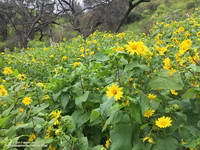 I’d had my fill of mustard and was happy to reach the dirt road in Big Sycamore Canyon. 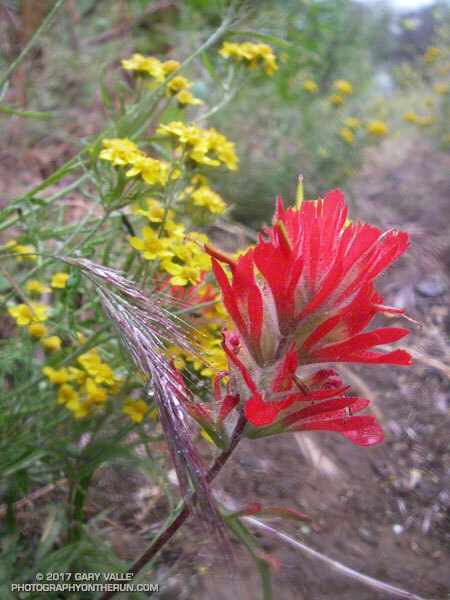 I returned up canyon using a combination of Big Sycamore Canyon Road and the Two Foxes Trail. This was much more straightforward than Old Boney and it took only about an hour to reach the Upper Sycamore Trail. 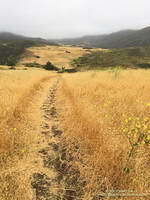 The work done on the Upper Sycamore Trail by the Santa Monica Mountains Trail Council during Trail Days was impressive. Several sections of the trail were washed away by the February 17 atmospheric river event and all have been restored.